AMDI Inc. has the expertise and manpower to take on any size and type of install. AMDI Inc. specializes in custom layouts and installations of wall and ceiling panels, soffits, casework, trims, moldings, countertops, entryways, door frames and decks. Our team works closely with the general contractors and ensures changes and modifications are incorporated into the design of the project. Many jobs we work on are fluid in nature meaning site conditions and designs sometimes do not coincide. AMDI Inc. ‘s experience and knowledge is an asset to Architects and Customers looking for advice and solutions to maintain the form fit and function of their design. We go above and beyond industry standards on all of our projects, utilizing the latest technologies in tools and instruments. Vacuum-assisted power tools are standard practice for clean air and clean working environments. Leeds Certification is a priority for many of our clients and they come to us to maintain compliance. Visit our portfolio and see why we are so busy. 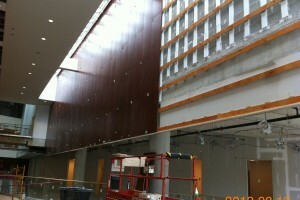 AMDI Inc. can perform all phases of rough carpentry during a buildings construction. From the ground up, our team can provide the first layer of carpentry which provides a reliable base for protective and decorative finish materials. For exterior work we install sleepers, furring, backing, nailers and wood cants as required to space-out and support fascia, soffits, parapets, siding and other work as required. Our installers abide by job specifications and follow updated drawings to ensure install locations and materials are approved and installed using the right fasteners. For interior rough carpentry our team will install rough bucks and nailers at rough openings for frames and in-wall blocking for casework and fixtures. AMDI Inc. has completed all facets of rough carpentry for Box Stores, Schools, Hospitals, Store Fixture Installations and Residential. 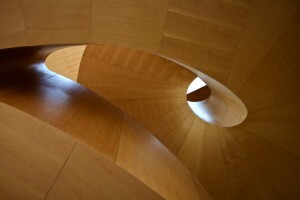 Visit our Portfolio for examples of rough carpentry installations. AMDI Inc. is certified to install and fuse any brand name solid surface countertop material on the market. Solid Surface is becoming very popular as a more durable substitute to laminate and provides the infectious control, durability and cleanliness our customers are looking for. Seamless joints, colour matching and buffing finishes are important characteristics for a good install. Our customers want their finishes to pop when they are being showcased. We also specialize in natural granite, Quartz and Caesar stone. If you want us to supply a countertop we have access to state of the art facilities utilizing premium equipment that provide the highest quality custom tops in any form, colour and type. 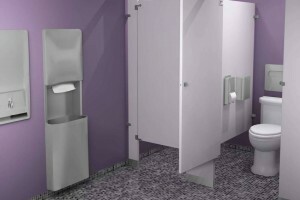 AMDI Inc. installs washroom accessories and partitions as part of a comprehensive install package. We install every type of accessory in strict compliance with manufacturer’s written instructions and building code recommendations. As part of our install we verify if blocking has been installed properly and use fasteners and anchors suitable for substrate and project conditions. We aim to conceal evidence of drilling, cutting and fitting to room sizes and minimize dust and debris through proper housekeeping protocols. Our carpenters layout accessories as per drawings and install the units straight, plumb and level. When installed, our team will verify locations do not interfere with door swings. We will test the function of the fixtures for proper operation and correct any deficiencies. 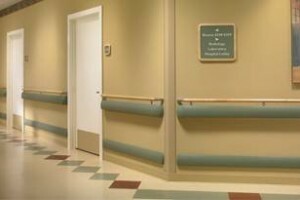 AMDI Inc. installs all types of wall protection, handrails and chair rails and corner guards. We have a system that is proven in the industry that speeds the process, eliminate waste and provides a rock solid installation. Handrails and crash rails and corner guards are meant to be used and abused in busy high traffic environments. Our team can properly layout the work area and apply the recommended trims, fasteners and adhesives used to keep the wall protection a durable and permanent fixture for years to come. AMDI Inc. equips our installers with recommended tools, safety equipment and PPE to ensure fumes and dust are not a hazard on the jobsite. We are Leeds trained and use environmentally friendly products when necessary to ensure infectious control and housekeeping standards are met. AMDI Inc. on average installs over 1000 doors per year on multiple jobs. Our estimators will review project door and hardware schedule’s to come up with a price to hinge, swing and install doors and rheir specified hardware. We will install hollow metal and wood doors on any type of project as illustrated in our Portfolio. 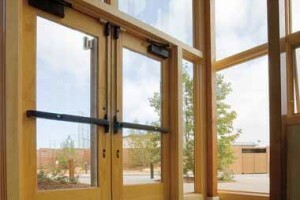 These doors range from complex hospital doors, elegant store doors to simple interior passage doors. Our team of door installers are specialized and trained in all facets of door hardware and are in high demand for courthouses, hospitals and other areas that need complex hardware installed. AMDI Inc. is called upon to secure courtrooms, provide secure entry to hospitals and schools, smooth closing systems for entry doors, weather tight applications and sound proofing. We test our installations to ensure hardware is functioning and will complete deficiencies related to our installation job.